On the various New Testament lists of the Twelve Apostles, the tenth and eleventh places are occupied by Simon the Zealot, also called Simon the Cananean, the Aramaic word meaning Zealot and by Judas (Jude), also called Thaddaeus. Simon is not mentioned by name in the New Testament except on these lists but was one of the Lord’s first cousins. He was raised in Nazareth, near the Holy Family and later left Galilee to preach in Egypt, Spain and Libya. 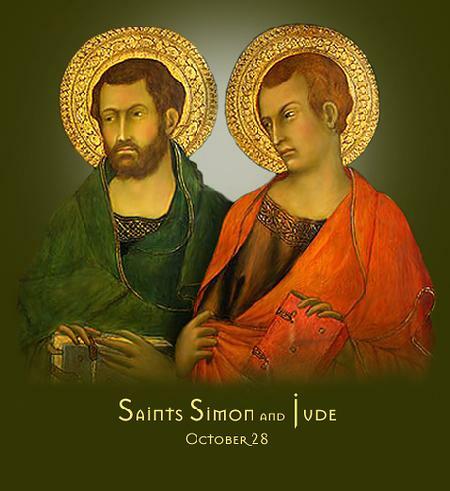 Some ancient Christian writers say that Simon and Jude went together as missionaries to Persia, and were martyred there. If this is true, it explains, to some extent, our lack of historical information on them and also why they are usually put together. The Epistle of Jude is a brief document addressed to the Church, and warns against corrupt influences that have crept in. It has some obscure and baffling references to old Jewish traditions, but it includes inspirational words of encouragement to fight for the faith and to be watchful for false teachers who pretend to be believers.